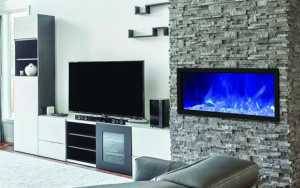 PROWELD | Stone Electric Fireplace in GTA | Wall-Mount | Buy Now Sale! Of the many kinds of electric fireplaces one can purchase, the simple elegance of a stone fireplace is unparalleled. From Sierra Flame to Amantii, a modern home can benefit from an insert stone fireplace in virtually any corner- from the bathroom to provide some much needed warmth, to a private study for that cozy atmosphere while perched reading a book in your favorite armchair. Stone fireplaces are simple, modern and elegant, and can be tailored to suit the design of your home. 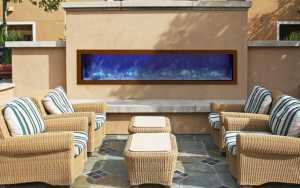 If your home has space for a fireplace insert, consider outlaying the outside with a trendy kind of stone such as travertine, limestone, black granite, slate or brick for a modern yet earthy touch. There are many kinds of stone fireplaces that we believe are beautiful, but for the purposes of this article we’ll only go through some of the most popular ones available on the market. A travertine fireplace is the staple of modern living. With a creamy color and an interesting pattern of stones arranged outside the fireplace, travertine can work beautifully in almost all spaces. Travertine can be arranged in one smooth surface or made into bricks of varying sizes and shapes to match the design needs of all homes. Travertine stones and tiles can vary in color from nearly white to a creamy burnt butter color, and they add a classic but modern touch around fireplaces. The stone can be molded into columns or ornate patterns for those with more artistic flair. We recommend sticking with an electric fireplace that looks as natural as possible with a travertine frame, as the colors of the stone tend to accentuate warmth. Limestone is a sedimentary rock often seen in natural rock outcroppings and cliffs. When pressed into tiles it can be anything from a smooth, glistening surface with many mineral irregularities to a rough, natural brick. Limestone fireplace surrounds are generally made into one smooth surface in a creamy white colour. A limestone fireplace looks lovely with tall classical columns emulating roman architecture, pressed smooth mantles which look like glassy tiles, or just simple flat surfaces surrounding a warm fire. A black granite fireplace is for those seeking a sleek, modern addition to a home that will not look too imposing when in place. Black granite is usually molded into smooth, glossy sheets that form a beautiful dark mantle. Granite showing natural veins and irregularities is also quite popularly used in conjunction with another, lighter stone. A granite mantle will work well with all types of electric fireplaces. Slate bricks or tiles come in colors varying from light grey to a deep earthy brown, and can be used together to create the illusion of bricks. Slate, similarly to granite, can be made into glossy sheets as well as bricks. These are most often used to make a large statement piece of the fireplace, as the colors themselves look very outstanding. Beautiful results have been achieved with slate slabs over the entirety of a wall. When someone says fireplace, most people imagine a large structure surrounded by bricks. Brick fireplaces are iconic of country and farm homes, cottages and old buildings. Coming in a variety of colors and easily painted over, brick is making a comeback in the modern fireplace. As a means of combining the picture of a farm home with a modern one, bricks are being used in conjunction with other building materials to create interesting patterns while retaining that earthy vibe. We offer the best stone Electric fireplaces in the region and our electric fireplaces currently featured in homes across the GTA, including Toronto, North York, Vaughan, Richmond Hill, Thornhill, Markham, Aurora, Newmarket, Brampton, Mississauga, Oakville, Burlington, and Hamilton. If you’re looking to purchase the best and most luxurious Electric Fireplace for your home, visit our store location today! Our brands feature Amantii & Sierra Flame.